Posted on June 2, 2017 by Matthew Leib. This entry was posted in Spotlight, Staff Stories and tagged engaging interests, staff story. Bookmark the permalink. Few who undertake the transition from actor to activist manage to continue to do both well. Bethany Staelens, on the other hand, has always performed where it counts. By night, Staelens sings at the front a 19-piece big band, but once the footlights fade and the next day dawns, she can be found at the University of Washington making an even bigger impact. 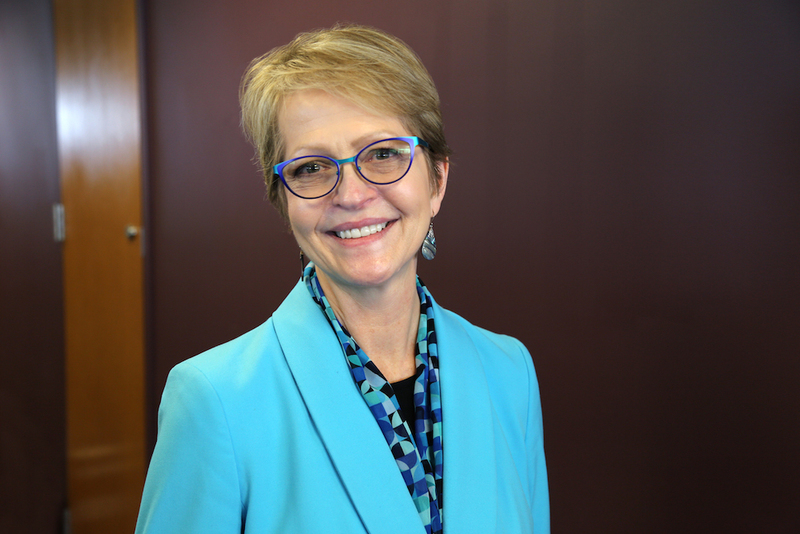 On top of her regular responsibilities as assistant to the vice provost of the UW’s Continuum College, Staelens has served as lead of the UW Tower Green Team since the group first launched in 2008. A recipient of UW Sustainability’s Husky Green Award this past April, Staelens says she doesn’t see what she does to promote environmentally sustainable practices as additional work as much as a necessary extension for her work in internal communications. In some instances, that price is a very real figure indeed, such as the costs incurred from paper waste across the UW. As part of the paper reduction efforts, Staelens and the Green Team instituted a policy at Continuum College that ensures non-sensitive scratch paper is made into notepads and distributed throughout the office, though she says she’d rather not have it come to that. It’s just one in a series of small actions and efforts that have begun to add up big at the Tower over the course of the past decade. The 22-story UW Tower was unlikely to be cast as the lead in any sustainability success story when its Green Team first launched in 2008. “This building is so unsustainable in so many aspects,” Staelens says of Tower Plaza, which completed construction in 1975 and served as the headquarters for Safeco Insurance before being acquired by the UW in 2006. “It’s a heat sink in the winter and a cooling sink in the summer,” Staelens says, adding that building features such as single-pane windows do it no favors, no matter what the weather. Even so, Staelens and the Green Team approached the building’s many challenges as opportunities for improvement. Beginning on the Continuum College’s four floors, the team’s initiatives—such as shutting curtains before leaving in the evening to retain heat in winter and keep it out in the summer—soon spread to other sections of the building. Today, Staelens coordinates the UW Tower Green Team’s five subcommittees: Food Cycle, which addresses issues such as composting and eating locally, the UW Tower Demonstration Garden, which seeks to adapt the Tower’s red brick plaza into “an attractive oasis of green urban food production,” Plastics Use, Paper Use, and Transportation Alternatives. Staelens says she doesn’t see her contributions to campus sustainability as anything spectacular, instead crediting partnerships between people—and the unexpected ideas and skills they bring to the table—as the cause for progress. Staelens’ own journey to the UW might be the perfect illustration of that very point. Sometimes you have to see the world to realize it’s worth saving. Growing up in New Bedford, Massachusetts, Staelens knew from a young age that she wanted to be a performer. She left home for college in Connecticut and never looked back—eventually dropping out to tour the country for a several years as a singer in a soul band in the ’70s. The band was in Alabama, having just cut a record, when their manager insisted they sign a new contract. Staelens balked at the dotted line, refusing to sign to what she recalls were “ridiculous” terms, so the band moved on without her. Not having enough money to get home to Massachusetts, the alto/contralto gravitated toward the Jazz Studies Program at the University of Alabama’s New College where she finished her degree. After graduation, she immediately found work singing on cruise ships, which she did consistently for several years before disembarking in New York. It’s one that took her all over the world. One cruise-singing stint took her from Ushuaia, Argentina—the southernmost city in the world at the edge of the Antarctic—to Carnival in Rio before plunging into the heart of the Amazon rainforest. She’s been to St. Petersburg eleven times—back when it still went by Leningrad. And, yes, the career of a globetrotting performer does come with a degree of international intrigue. Needing to get the paintings past armed guards checking packages before re-boarding the cruise ship, Staelens hid them under her shirt. Today, they hang in her home in Shoreline. While New York City remained a constant port of call and source of steady acting and performance work, Stalaens’ summer base during her years abroad was Copenhagen, while most winters were spent crooning below deck while cruising the coast of South America. She met her husband Bruce, a trumpet-player, while both were on tour in Germany with a production of 42nd Street. They eventually returned to New York on a more permanent basis, where, between acting and singing gigs, Staelens spent a decade working in the office of Keith Richards, archiving photos of the Rolling Stones dating back to the 1960s. The UW was high on her list. She applied for a job and had hardly finished packing up her apartment in Queens when she was invited for an interview. She flew out, received an offer, and started working—and living—in Washington the following week. “People just really appreciate being out here,” she says of her adopted home in the Pacific Northwest and day job at the Continuum College that allows her to scratch her itch as an activist and organizer while simultaneously supporting her a career on-stage. “It’s important to not lose focus on what you’ve always thought was really important,” she says. For Staelens, that has always meant being true to herself as both an environmentalist and entertainer. After a career at sea and on stage, touring throughout Europe and playing nightclubs and festivals from New Orleans to New York, it would seem there are few stages better suited than Washington’s for playing both roles to the hilt. Catch Bethany June 7 at Tula’s Jazz Club with her big band, The Smith Staelens Big Band and on June 24 on the main stage at the Triple Door as part of Joey Jewell’s’ Sinatra at the Sands. Her album, The Big Band Theory, is available here.